SlimTrader, founded by Nigerian-American Femi Akinde, is an e-commerce firm that is meant to ease the exchange of goods and widen the online markets for Africans. Umuntu Media is another African-based host website that caters to the mobile world. Umuntu was founded only one and a half years ago by Johan Nel, a native of Namibia. The idea of Umuntu, Mr Nel explains, is to "close the local content gap, to provide users with information that is useful to them." After Umuntu took off in web and mobile form, Mr Nel had a vision to use it as a springboard to further tap into mobile e-commerce with the creation of the mobile site, Mimiboard, which has been live for a month. Mimiboard ('mimi' means 'I' in Swahili) is Mr Nel's brainchild to deliver hyper-local content in the form of a traditional notice board. 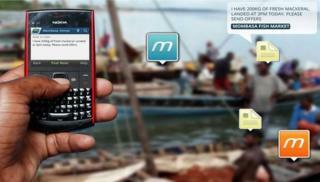 "For example," Mr Nel explains, "a fisherman in Mombasa can post about his catch of the day to mimiboard, then other users in the area can go buy the fish." In Mr Nel's words: "If someone wants to sell their car through a specific mimiboard, the person who created that mimiboard will receive a micropayment for the transaction." As Mr Nel puts it: "This type of technology we are working to develop is one that we hope will solve African problems while putting Africa on the map for innovative solutions."